Wilt Chamberlain won a record 11 rebounding titles in his career. Bill Russell was the rebounding leader from 1958 to 1959 and from 1964 to 1965. 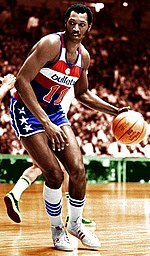 Elvin Hayes was the rebounding leader in 1970 and 1974. Moses Malone was the rebounding leader in 1979 and from 1981 to 1985. 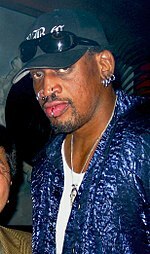 Dennis Rodman was the rebounding leader from 1991 to 1998. Kevin Garnett was the rebounding leader from 2004 to 2007. 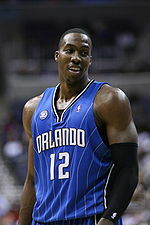 Dwight Howard was the rebounding leader from 2008 to 2010 and from 2012 to 2013. ^ Wilt Chamberlain holds the all-time rookie record for total rebounds. ^ Wilt Chamberlain holds the all-time record for total rebounds and rebounds per game in a single season. ^ In the 1974–75 season, Bob McAdoo and Sam Lacey both had higher rebound totals (1,155 and 1,149 respectively) but they ranked fourth and third in rebounding average (14.1 and 14.2 respectively). 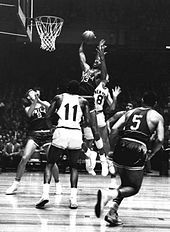 ^ In the 1976–77 season, Kareem Abdul-Jabbar, Moses Malone, Artis Gilmore and Elvin Hayes all had higher rebound total (1,090, 1,072, 1,070 and 1,029 respectively) but they ranked second, third, fourth and sixth in rebounding average (13.3, 13.1, 13.0 and 12.5 respectively). ^ In the 1983–84 season, Bill Laimbeer and Buck Williams both had higher rebound totals (1,003 and 1,000 respectively) but they ranked fourth and second in rebounding average (12.2 and 12.3 respectively). ^ In the 1986–87 season, Charles Oakley and Buck Williams both had higher rebound totals (1,074 and 1,023 respectively) but they ranked second to third in rebounding average (13.1 and 12.5 respectively). ^ In the 1987–88 season, Charles Oakley had the highest rebound total (1,066) but was second in rebounding average (13.0). ^ When Olajuwon arrived in the United States, the University of Houston incorrectly spelled his first name "Hakeem". He used that spelling until March 9, 1991, when he announced that he would add an H.
^ In the 1994–95 season, Dennis Rodman had only played in 49 games and ranked tenth in rebound total. Dikembe Mutombo had the highest total (1,029). ^ In the 1995–96 season, David Robinson had the highest rebound total (1,000) but was second in rebounding average (12.2). ^ In the 1996–97 season, Dikembe Mutombo and Ervin Johnson both had higher rebound totals (929 and 913 respectively) but they ranked second and fourth in rebounding average (11.6 and 11.1 respectively). ^ The 1998–99 season was shortened to 50 games due to the league's lockout. The qualification of this season's rebounding title is to appear in at least 43 games (out of 50) or to have at least 488 rebounds. ^ In the 1998–99 season, Dikembe Mutombo, Danny Fortson and Tim Duncan all had higher rebound totals (610, 581, and 571 respectively) but they ranked third to fifth in rebounding average (12.2, 11.6 and 11.4 respectively). ^ In the 2000–01 season, Ben Wallace had the highest rebound total (1,052) but was second in rebounding average (13.2). ^ In the 2001–02 season, Tim Duncan had the highest rebound total (1,042) but was second in rebounding average (12.7). ^ In the 2005–06 season, Dwight Howard had the highest rebound total (1,022) but was second in rebounding average (12.5). ^ In the 2006–07 season, Dwight Howard had the highest rebound total (1,008) but was third in rebounding average (12.3). ^ The 2011–12 season was shortened to 66 games due to the league's lockout. The qualification of this season's rebounding title is to appear in at least 56 games (out of 66) or to have at least 644 rebounds. ^ In the 2012–13 season, Ömer Aşık had the highest rebound total (956) but was third in rebounding average (11.7). "Yearly Leaders and Records for Rebounds Per Game". basketball-reference.com. Retrieved February 22, 2010. ^ "Basketball glossary". FIBA.com. Retrieved March 4, 2010. ^ "Regular Season Records: Rebounds". NBA.com. Turner Sports Interactive, Inc. Retrieved February 22, 2010. ^ a b c "Rate Statistic Requirements". basketball-reference.com. Retrieved March 5, 2010. ^ a b c "Wilt Chamberlain". NBA.com. Turner Sports Interactive, Inc. Retrieved February 22, 2010. ^ a b c "Wilt Chamberlain's NBA records". NBA.com. Turner Sports Interactive, Inc. Retrieved February 22, 2010. ^ "Magic rest starters, ride Redick, Gortat to blowout of Wizards". espn.com. April 16, 2008. Retrieved April 25, 2013. ^ "Dennis Rodman". NBA.com. Turner Sports Interactive, Inc. Archived from the original on April 20, 2010. Retrieved February 22, 2010. ^ a b c d e f g h i j k l m n o p q r s t u v w x y z aa ab ac ad ae af ag ah ai aj ak al am an ao ap aq ar as at au av aw ax ay az ba bb bc bd be bf bg bh bi bj bk bl "2013-14 Official NBA Guide" (PDF). nba.com. November 6, 2013. Retrieved December 29, 2013. ^ "Dolph Schayes Stats". basketball-reference.com. Retrieved February 22, 2010. ^ "Larry Foust Stats". basketball-reference.com. Retrieved December 29, 2013. ^ "Mel Hutchins Stats". basketball-reference.com. Retrieved December 29, 2013. ^ "George Mikan Stats". basketball-reference.com. Retrieved February 22, 2010. ^ "Harry Gallatin Stats". basketball-reference.com. Retrieved February 22, 2010. ^ "Neil Johnston Stats". basketball-reference.com. Retrieved February 22, 2010. ^ "Bob Pettit Stats". basketball-reference.com. Retrieved December 29, 2013. ^ "Maurice Stokes Stats". basketball-reference.com. Retrieved February 22, 2010. ^ a b c d "Bill Russell Stats". basketball-reference.com. Retrieved February 22, 2010. ^ a b c d e f g h i j k "Wilt Chamberlain Stats". basketball-reference.com. Retrieved February 22, 2010. ^ "League Leaders: Rebounds – 1969–70". NBA.com. Turner Sports Interactive, Inc. Retrieved February 22, 2010. ^ a b "Elvin Hayes Stats". basketball-reference.com. Retrieved February 22, 2010. ^ "League Leaders: Rebounds – 1970–71". NBA.com. Turner Sports Interactive, Inc. Retrieved February 22, 2010. ^ "League Leaders: Rebounds – 1971–72". NBA.com. Turner Sports Interactive, Inc. Retrieved February 22, 2010. ^ "League Leaders: Rebounds – 1972–73". NBA.com. Turner Sports Interactive, Inc. Retrieved February 22, 2010. ^ "League Leaders: Rebounds – 1973–74". NBA.com. Turner Sports Interactive, Inc. Retrieved February 22, 2010. ^ a b "League Leaders: Rebounds – 1974–75". NBA.com. Turner Sports Interactive, Inc. Retrieved February 22, 2010. ^ "Wes Unseld Stats". basketball-reference.com. Retrieved February 22, 2010. ^ "League Leaders: Rebounds – 1975–76". NBA.com. Turner Sports Interactive, Inc. Retrieved February 22, 2010. ^ "Kareem Abdul-Jabbar Stats". basketball-reference.com. Retrieved February 22, 2010. ^ a b "League Leaders: Rebounds – 1976–77". NBA.com. Turner Sports Interactive, Inc. Retrieved February 22, 2010. ^ "Bill Walton Stats". basketball-reference.com. Retrieved February 22, 2010. ^ "League Leaders: Rebounds – 1977–78". NBA.com. Turner Sports Interactive, Inc. Retrieved February 22, 2010. ^ "Truck Robinson Stats". basketball-reference.com. Retrieved February 22, 2010. ^ "League Leaders: Rebounds – 1978–79". NBA.com. Turner Sports Interactive, Inc. Retrieved February 22, 2010. ^ a b c d e f "Moses Malone Stats". basketball-reference.com. Retrieved February 22, 2010. ^ "League Leaders: Rebounds – 1979–80". NBA.com. Turner Sports Interactive, Inc. Retrieved February 22, 2010. ^ "Swen Nater Stats". basketball-reference.com. Retrieved February 22, 2010. ^ "League Leaders: Rebounds – 1980–81". NBA.com. Turner Sports Interactive, Inc. Retrieved February 22, 2010. ^ "League Leaders: Rebounds – 1981–82". NBA.com. Turner Sports Interactive, Inc. Retrieved February 22, 2010. ^ "League Leaders: Rebounds – 1982–83". NBA.com. Turner Sports Interactive, Inc. Retrieved February 22, 2010. ^ a b "League Leaders: Rebounds – 1983–84". NBA.com. Turner Sports Interactive, Inc. Retrieved February 22, 2010. ^ "League Leaders: Rebounds – 1984–85". NBA.com. Turner Sports Interactive, Inc. Retrieved February 22, 2010. ^ "League Leaders: Rebounds – 1985–86". NBA.com. Turner Sports Interactive, Inc. Retrieved February 22, 2010. ^ "Bill Laimbeer Stats". basketball-reference.com. Retrieved February 22, 2010. ^ a b "League Leaders: Rebounds – 1986–87". NBA.com. Turner Sports Interactive, Inc. Retrieved February 22, 2010. ^ "Charles Barkley Stats". basketball-reference.com. Retrieved February 22, 2010. ^ a b "League Leaders: Rebounds – 1987–88". NBA.com. Turner Sports Interactive, Inc. Retrieved February 22, 2010. ^ "Michael Cage Stats". basketball-reference.com. Retrieved February 22, 2010. ^ "League Leaders: Rebounds – 1988–89". NBA.com. Turner Sports Interactive, Inc. Retrieved February 22, 2010. ^ a b "Hakeem Olajuwon Stats". basketball-reference.com. Retrieved February 22, 2010. ^ "League Leaders: Rebounds – 1989–90". NBA.com. Turner Sports Interactive, Inc. Retrieved February 22, 2010. ^ "League Leaders: Rebounds – 1990–91". NBA.com. Turner Sports Interactive, Inc. Retrieved February 22, 2010. ^ "David Robinson Stats". basketball-reference.com. Retrieved February 22, 2010. ^ "League Leaders: Rebounds – 1991–92". NBA.com. Turner Sports Interactive, Inc. Retrieved February 22, 2010. ^ a b c d e f g "Dennis Rodman Stats". basketball-reference.com. Retrieved February 22, 2010. ^ "League Leaders: Rebounds – 1992–93". NBA.com. Turner Sports Interactive, Inc. Retrieved February 22, 2010. ^ "League Leaders: Rebounds – 1993–94". NBA.com. Turner Sports Interactive, Inc. Retrieved February 22, 2010. ^ a b "League Leaders: Rebounds – 1994–95". NBA.com. Turner Sports Interactive, Inc. Retrieved February 22, 2010. ^ a b "League Leaders: Rebounds – 1995–96". NBA.com. Turner Sports Interactive, Inc. Retrieved February 22, 2010. ^ a b "League Leaders: Rebounds – 1996–97". NBA.com. Turner Sports Interactive, Inc. Retrieved February 22, 2010. ^ "League Leaders: Rebounds – 1997–98". NBA.com. Turner Sports Interactive, Inc. Retrieved February 22, 2010. ^ a b "League Leaders: Rebounds – 1998–99". NBA.com. Turner Sports Interactive, Inc. Retrieved February 22, 2010. ^ "Chris Webber Stats". basketball-reference.com. Retrieved February 22, 2010. ^ "League Leaders: Rebounds – 1999–2000". NBA.com. Turner Sports Interactive, Inc. Retrieved February 22, 2010. ^ a b "Dikembe Mutombo Stats". basketball-reference.com. Retrieved February 22, 2010. ^ a b "League Leaders: Rebounds – 2000–01". NBA.com. Turner Sports Interactive, Inc. Retrieved February 22, 2010. ^ a b "League Leaders: Rebounds – 2001–02". NBA.com. Turner Sports Interactive, Inc. Retrieved February 22, 2010. ^ a b "Ben Wallace Stats". basketball-reference.com. Retrieved February 22, 2010. ^ "League Leaders: Rebounds – 2002–03". NBA.com. Turner Sports Interactive, Inc. Retrieved February 22, 2010. ^ "League Leaders: Rebounds – 2003–04". NBA.com. Turner Sports Interactive, Inc. Retrieved February 23, 2010. ^ a b c d "Kevin Garnett Stats". basketball-reference.com. Retrieved February 22, 2010. ^ "League Leaders: Rebounds – 2004–05". NBA.com. Turner Sports Interactive, Inc. Retrieved February 23, 2010. ^ a b "League Leaders: Rebounds – 2005–06". NBA.com. Turner Sports Interactive, Inc. Retrieved February 23, 2010. ^ a b "League Leaders: Rebounds – 2006–07". NBA.com. Turner Sports Interactive, Inc. Retrieved February 23, 2010. ^ "League Leaders: Rebounds – 2007–08". NBA.com. Turner Sports Interactive, Inc. Retrieved February 23, 2010. ^ a b c d e "Dwight Howard Stats". basketball-reference.com. Retrieved February 22, 2010. ^ "Kevin Love Stats". basketball-reference.com. Retrieved April 13, 2011. ^ a b "2012–13 Rebounding Leaders: Rebounds Per Game". NBA.com. Turner Sports Interactive, Inc. Archived from the original on January 23, 2013. Retrieved April 23, 2013. ^ "DeAndre Jordan Stats". basketball-reference.com. Retrieved April 17, 2014. ^ "DeAndre Jordan Stats". basketball-reference.com. Retrieved April 15, 2015. ^ a b c "Andre Drummond Stats". basketball-reference.com. Retrieved April 13, 2017. ^ "Hassan Whiteside Stats". basketball-reference.com. Retrieved April 13, 2017.